Now that it's September and there's a coolness to the air, W. has been in full on preparation for winter. By the end of the day, he'll have been through a bushel of tomatoes (half beefsteak, half plum), and made slow roasted tomatoes, tomato puree, and a vat of pomorola sauce. It's all going in the freezer, and will be gone by the time summer is here again. 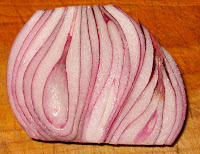 This red onion was so strange and beautiful inside that I almost wanted to use it as a rubber stamp. The roasted tomatoes get a sprinkle of dried herbs, salt, and pepper and a tiny drizzle of olive oil, and go in the oven for a couple of hours at about 225°. They dry out a little and collapse a bit. We'll then freeze them on the sheet pans, and transfer them to bags when they're fully hard. The sauce is just tomato, red onion, garlic, basil, carrot, celery and a glug of olive oil. Nothing is sauteed; it's just all cooked down at once, and then run through the food mill. It's fine over pasta as is, or can be the base for something more complicated. 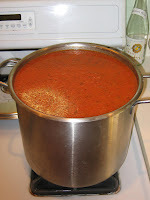 I don't know how big that stock pot is, but yes, that is a lot of sauce. It wasn't cooked in that pot...it was done in three smaller batches and then combined to cool before being divided up into freezer containers. How lovely....and how wonderful to have a taste of summer in the middle of winter. Those roasted tomatoes are just beautiful, all lined up like that. I froze tons of tomato sauce last summer, a similar collection of ingredients to your, though minus the onion. But when I opened the containers, the frost from the freezer had gotten in, so while I sure they were fine, I ended up throwing them alls away. Ahhh, now roasting tomatoes is an excellent idea I wish I'd thought of. After I made sauce and my husband made salsa, I had about a dozen and a half tomatoes left. I froze them whole -- easy, but I'll be wishing they were something else this winter! that onion is stunningly lovely. i don't know exactly why. Wow! What a cool post! I love your onion and love your photos of the matoes! Wow. impressive. You'll have some good eatin' in the winter! My freezer is slowly filling with courgette, green beans, freezer jams and herbs. Sadly, we had not tomatoes this year. I'll be taking the machete to the pumpkins soon... Almost done making pickles. I showed some friends the joys of roasted cherry tomatoes last night-- I'll be making my own to pop into the freezer under oil today. You are doing what I know I should be doing, but am not. I've just discovered the joys of roasted tomatoes. I roasted a bunch with some garlic cloves and olive oil, and damn were they tasty. I want to do that. Why am I not doing that!? Too bad you're not my generous neighbor!! My garden has produced more tomatoes this year than ever. It's hard for me to get motivated to do anything culinary with the extra bounty when I'm knee deep in tomatoes, as it is. The best I do is to ding-dong-ditch my neighbors and leave bags of vine ripe toms on their door step. Enjoy your breath of summer in the dregs of winter! What a delicious way to savor summer. Looks awesome, doesn't help that I am starved either!